Quilted patchwork is ideal for table runners. My goal is to have a matching decorative piece on my dining table each month. On this page there will gradually appear more patterns - there are, after all, twelve months to equip. When cold winds are blowing and even snow is falling at the beginning of the year it is time to look forward to those colorful primeroses! Here February is the carnival month. Sprinkle some confetti and high spirits on your table with this potpourri of Primeroses. See my tabe runner and pillow in the gallery. This is a pattern to raid the scrap baskets! In September we are looking forward to the apple harvest. The healthy and delicious fruit is also nice-looking! You may download this pattern for free! If you got appetite for more go to this apple garden. When autumn leaves are falling I always like to collect some. Unfortunately they dry out and crinkle soon. 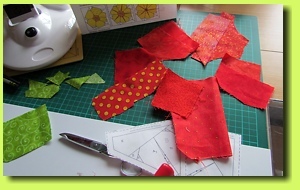 Leaves from fabric are long lasting and bring back the beauty each year if stitched i.e. into a table runner. The autumn storms roll and swirl not only the colorful umbrellas around, but the fallen leaves as well! Sale into non-European foreign countries is only possible through PayPal. Your payment via PP is free and easy; I have used it for years without any problems. You may create an account during the payment process.